Good morning to you! And what a good mernin’ it is with this coconut cashew granola with golden raisins AKA Golden Granola. 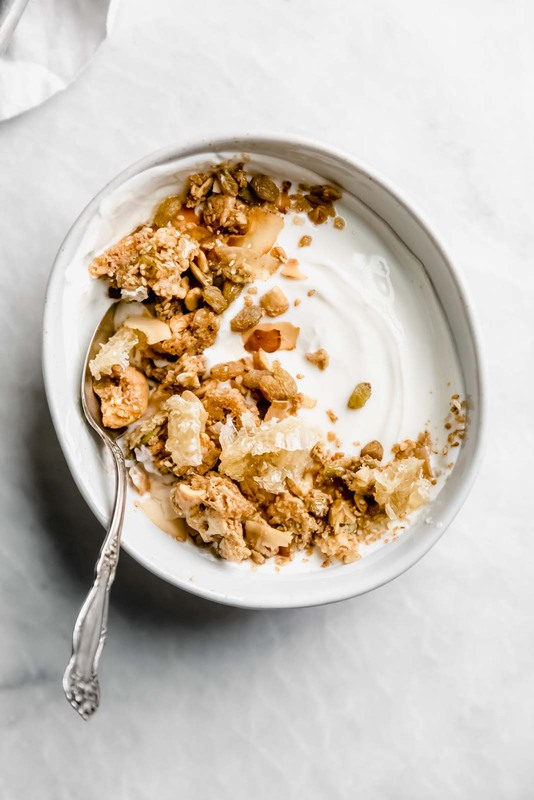 This olive oil granola is perfectly salty and sweet, studded with golden raisins (our fav) and perfect for eating with milk, on top of yogurt, or just by the handful on your way out the door. 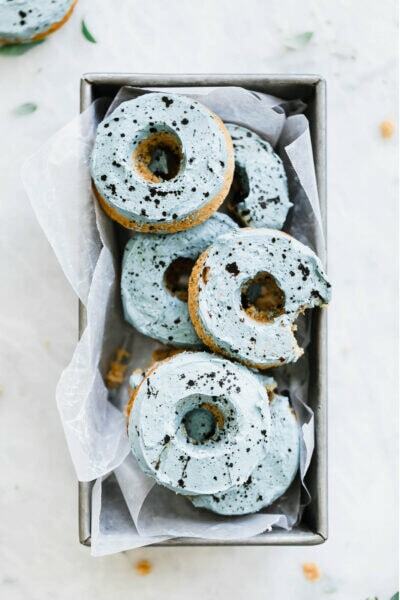 Better yet, it’s super easy to make. Buying high quality granola can be so expensive. And like, I get it. If you’re buying a hearty, good for you granola, it’s going to be made with some expensive ingredients, but like $14.99 for some gourmet granola?! Especially when it’s so easy to make at home. How to make homemade granola? We used a combination of old fashioned oats, oat flour, pumpkin seeds, coconut chips, cashews, cinnamon, maple syrup, olive oil, and sea salt! The result? A salty sweet granola with a beautiful golden hue. 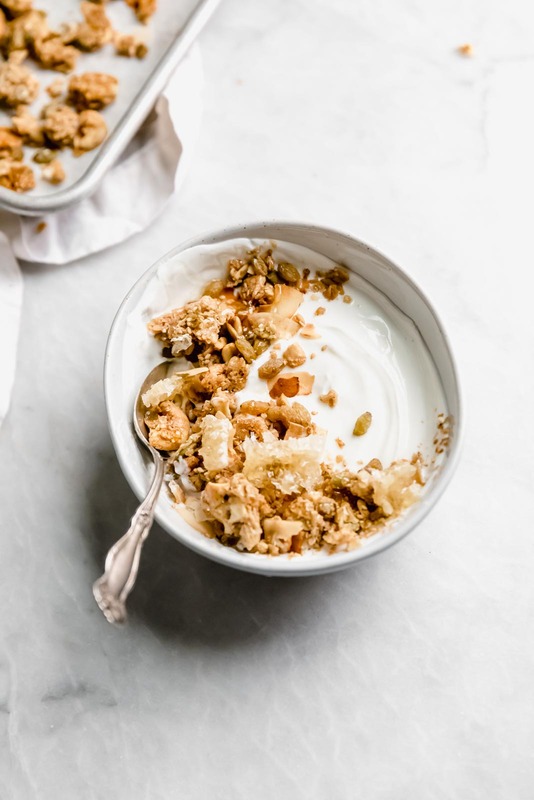 The oat flour gives this granola the bind it needs to stay together, while the coconut chips give it a buttery crunch. Mix all the dry ingredients togethers: In a large bowl mix together the oats, pumpkin seeds, coconut chips, cashews, cinnamon, and salt. Stir the wet ingredients into the dry: Add the maple syrup and olive oil to the dry ingredients and toss everything together until all the dry ingredients are well coated. If you’re using sugar in your granola (we didn’t want ours to be too sweet so we didn’t! ), you’ll want to heat the wet ingredients in a small sauce pan until the sugar dissolves before tossing with your dry ingredients! 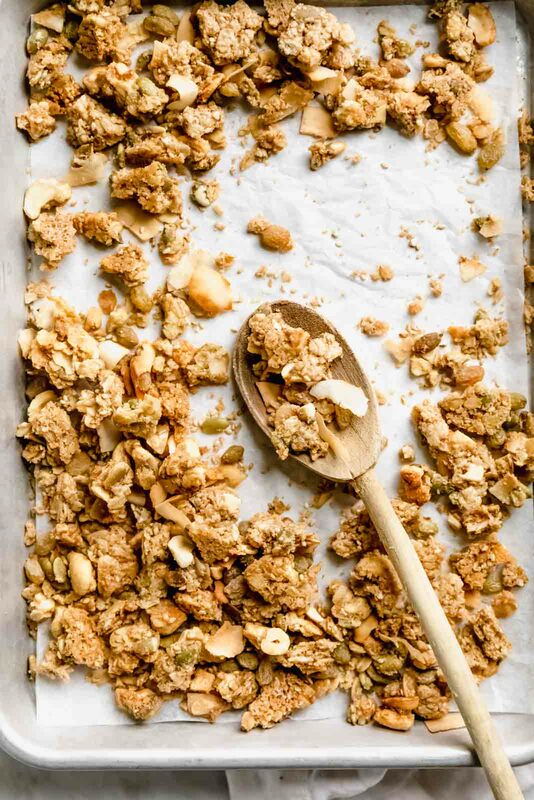 Shape the granola into a disc and bake: We like our granola to have huge chunks in it, so we use oat flour to bind it together and then form the granola into a disc when we bake it. Simply pat your granola into an oblong flat oval and bake at 325°F until it’s golden brown. 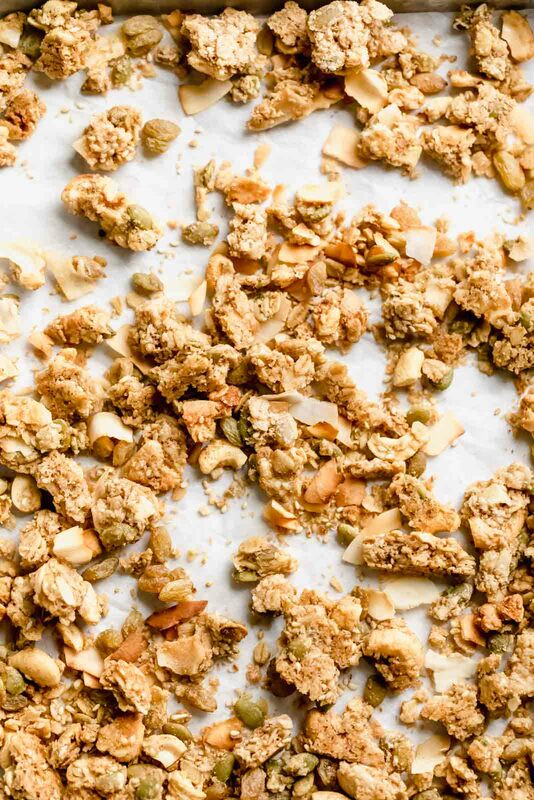 Turn off the oven and leave the granola in the oven to crunch up even more. Crumble up your granola, store, and eat! 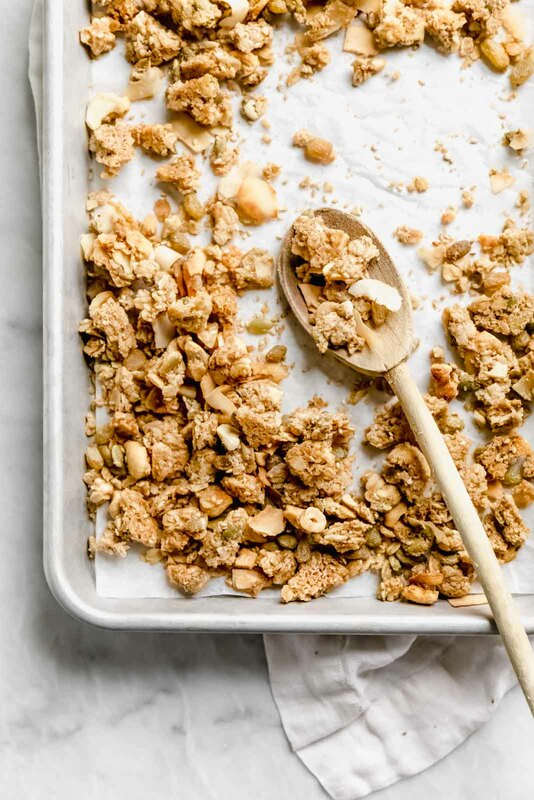 Once the granola is cool you can break it into large chunks or crumble into smaller ones. Add the raisins (we didn’t add them before you put everything in the oven because they’d dry out!). Store in an airtight container or plastic bag and enjoy on yogurt, with milk, or plain! Ahh golden raisins. We LOVE them. I think we can alllll agree that golden raisins are far superior to normal ones. They’re juicier, plumper and tend to be more flavorful, than their shriveled up counterparts. So what’s the difference between regular and golden raisins? So go ahead and put that expensive af granola back on the shelf. 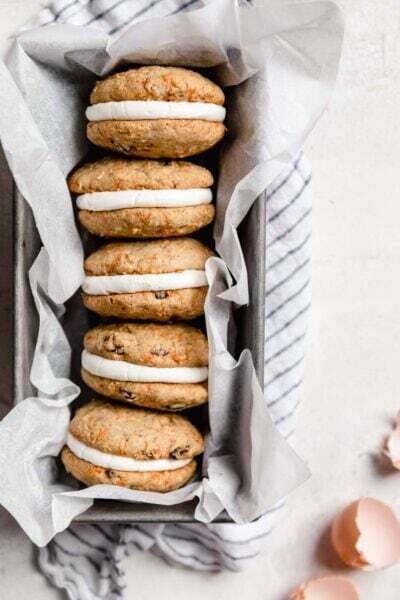 Make your own and munch on it all day long like we are! Happy halfway through the week bbs. 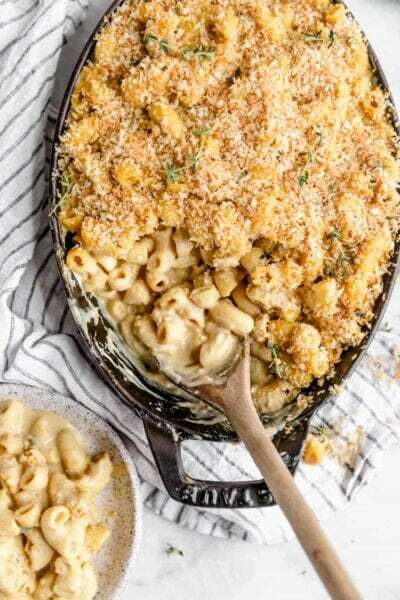 See ya Friday with a new recipe we are SO excited to share (hint: it’s cheesy and it’s vegan). Golden Granola AKA coconut, cashew, olive oil granola wtih golden raisins (our fav) is perfectly salty and sweet. Delicious with yogurt or by the handful and super easy to make! Combine the cashews, oats, pumpkin seeds, coconut chips, oat flour, salt, and cinnamon in a large bowl and mix to combine. Make a well in the center and drizzle the maple syrup and olive oil into the mixture. Stir everything together. It should be slightly wet, but not soupy. Pour the mixture onto your prepared sheet and form into a about 1/4 inch thick flat disk, pressing everything down with your hands to get everything together. This will ensure you get those clusters you want. Bake for 40 minutes, or until the granola turns golden brown. Turn the oven off and leave the oven door slightly ajar. Leave the granola in the oven for another 20 minutes to let it get super crunchy. 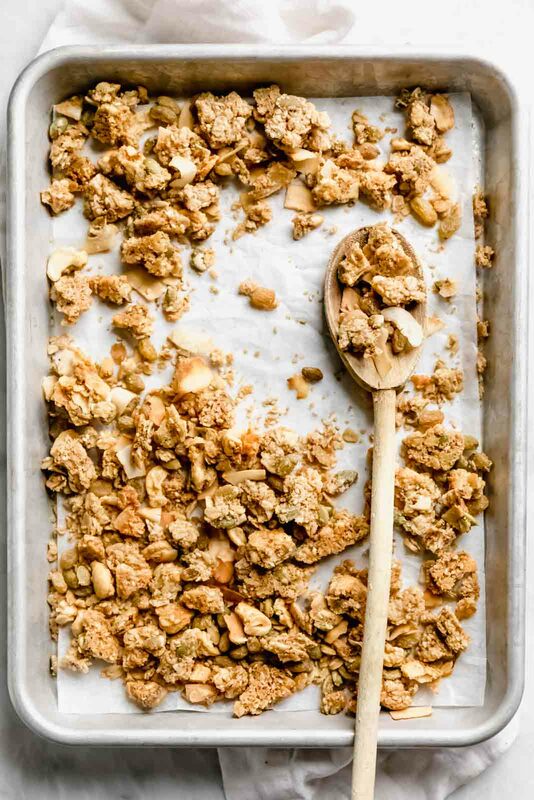 Allow granola to cool and then crumble up, stir in the golden raisins, and place in an airtight container or plastic bag. Granola keeps well for up to 3 weeks (but I promise you’ll finish it before then). This is a delicious recipe. It will now be my stand-by granola recipe that I will customize with different nuts and fruits. YAY. So happy you liked it!